Cardboard is great. It can be shelter, it can be storage, it can be entertainment, it can be invisibility on the battlefield, and if taken to the extreme, it can be art. 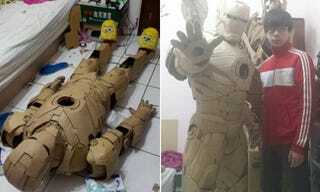 Taiwanese artist Xhong Kai-Xiang definitely takes cardboard to another level. According to a blog post on the Stan Winston School of Character Arts, Xhong has recently unveiled an Iron Man armour that's taken him over a year to complete! The armour, which resembles the Mark III from the movies, looks pretty awesome. It's unclear if it's a wearable suit or not. On top of working on Iron Man armour, Xhong also created a replica of the T-Rex icon from Jurassic Park and a Chinese dragon, among many other things. He's even got a bearded dragon sculpture that looks so close the real thing that the folks over at the Stan Winston School were nearly fooled.